Below are our range of carriers for transporting your kayaks and canoes on the roof rack of your vehicle. J-Bar style cradle for carrying kayaks on their side and provides a secure fit. Sturdy restraining straps secure the kayak, and the protection around the metal buckle avoids damage to the kayak. 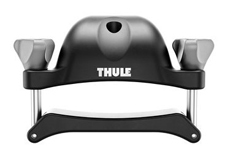 Thule 837 Hull-A-Port Pro An evolution of the popular Hull-a-Port. It is a J-Bar style carrier that can be folded down when not in use to reduce drag and to fit into garages. Thule Hullavator Pro 898 is a lift assisted kayak carrier that handles up to 18kg of your kayaks weight for you and lowers down to waist height. 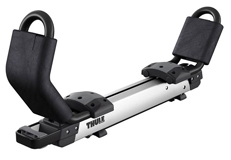 Buy a pair of Thule ProBar's for only £80.10 (usually £130) when purchased with the Thule Hullavaotr Pro 898. Thule 520-1 Folding Uprights A pair of uprights for carrying one or two kayaks vertically, on their sides for reduced wind resistance when driving. The Thule Portage 819 is designed to carry your canoe or kayak securely using its 4 padded load stops that eliminate any sideways movement. Versatile padded carrier that can securly transport kayaks and SUP's. Adjustable kayak carrier with felt lined cradles to allow you to slide your kayak into position. 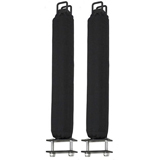 Padded upright bars for use with Sit On Top kayaks and loading open canoes on there side. Available in 40cm Height and sold as a pair.